Please welcome Tony Peak to the blog! His new book, Inherit the Stars, just came out today, and he kindly answered a few of my questions about it, and more! Congrats on the new book! Will you tell us a little about Inherit the Stars and what inspired it? Thank you. 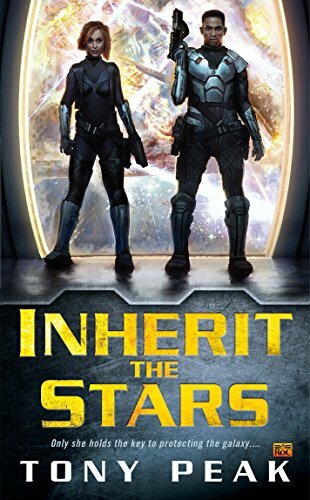 Inherit the Stars is a story of self-discovery, set against a backdrop of faraway worlds and the remnants of an alien civilization. But more than mere self-discovery, it also asks, what does one do with what they have learned? Will they use it to benefit others, or for selfish reasons? Knowledge is indeed power, and learning it can have galactic consequences. The novel was inspired by so many things—my love for Star Wars, my interest in astronomy, and the drama of traveling the cold void simply to see what’s out there—and in the process, see within ourselves. Plus, I have always wanted to tell a story about a spacefaring civilization that held advanced alien technology sacred; a religious conviction that one must seek out salvation among the stars. Then they find out the truth, which is far beyond anything they could have imagined. So the opposition of superstition and reason are underlying themes as well. Why do you think readers will root for Kivita and Sar? What makes them compelling characters? Kivita is a spunky loner who sleeps years at time between the stars to salvage alien artifacts. Though she loves adventure, she’s also distancing herself from those who have left her heartbroken. With no family, and no friends, she hurts inside, trying to find joy in her passion for exploration. The void insulates Kivita from her problems, even as it freezes her heart. She’s sort of an underdog, but never gives up. On the other hand, Sar is a man plagued by secrecy, and weighed down by his hatred of those who invaded his homeworld and killed his sister. He too is a loner, but for different reasons. Sar is afraid that the things he does could harm those he cares about, so he avoids emotional attachment. He fears that his journeys across the light years, and his dangerous exploits, are reducing his humanity. But he refuses to give up the struggle, to look away while world after world falls to a zealous onslaught. Neither of them want to be heroes, nor do they seek power for power’s sake. They want the same things most of us want—love, peace, and safety. But everything has a price. I brushed up on basic astronomy and even more basic astrophysics, but this is in no way a Hard SF novel. I tried to pay extra attention to how gravity might affect people and vessels. Since I created the setting, research was channeled into how I would present different cultures and belief systems, spread across many worlds. Much of that work is in the story’s background, where it belongs, but I hope there’s enough to give readers a sense of reality underlying each planet, every society, and each dialect. Have you always wanted to be a writer? Can you tell me more about yourself and your background? I remember, in the fifth grade, that I wanted to be an astronaut, a scientist, an astronomer, an oceanographer, and an artist. In a way, writing has allowed me to be all of those things. In my early 20s I wrote the occasional story, or even novella, but lacked the confidence to send my work out there. At the time I wanted to write historical fiction (imagine that!). It wasn’t until 2008 that I finally took writing seriously, and here I am. I’ve lived in rural southwest Virginia all my life, and I love being in the shadow of the Blue Ridge Mountains. I have a wonderful view of New River from my property, so perhaps, growing up in such wide-open spaces, my imagination developed without limits. There’s so many different things that interest me: planetary exploration, Transhumanism, environmentalism, anthropology, and history (especially the Late Bronze Age Aegean, Dark Age Britain, Mesoamerican history, and the Colonial period of my home region). I’m a politically progressive atheist, and a member of the Planetary Society and The Long Now Foundation. I love good wine, especially Beaujolais or Chardonnay. I have a passion for music of all genres, from classical, rock, pop, metal, opera, world, electronica, jazz, film & video game soundtracks, R&B, New Age, folk—a quarter of my collection isn’t even in English. I enjoy course lectures from the Teaching Company, and I still want to learn Spanish. One should never stop learning. There was a science fiction story I wrote for spelling class in the sixth grade, about soldiers in black battle armor that used lasers with a green beam. It’s important because one of the elements in it, an ‘Aldaakian Shock Trooper’, is featured in Inherit the Stars. Some things are never forgotten until you write them into a story—literally decades later. Why science fiction? What do you enjoy most about reading, and writing, in the genre? Asking ‘why science fiction?’ is like asking, ‘why do I breathe?’. It’s always been a part of me since watching Stars Wars at five years old. I grew up in the 80s, the decade of the Space Shuttle, Apple computer, Atari, and Devo. It’s subliminally ingrained. I’ve always been excited by the future, and science fiction is an outlet for my hopes and dreams. It just felt right, that humanity should progress, learn more about itself and the universe, and never stop reaching. What I enjoy most about reading the genre is that it explores much more than alien worlds. It explores the human condition. Science fiction prepares us for the future, warns us of our faults and excesses, and inspires us to achieve the impossible. Without Arthur C. Clarke, how long would it have taken our society to build satellites? Without Star Trek, what would have influenced the inventor of the cell phone? Without George Orwell, who would have warned us that we are losing our privacy, our liberties? I never set out to be a science fiction writer. I’m not a physicist; math was my worst subject in school. But no other genre can express the ideas I want to share with readers. No other genre can convey the hope I have, that we can become something better, rather than destroy ourselves as a species. You’ve got a list of some of your favorite authors on your blog, but if you could read one book again for the first time, which one would it be? That’s a hard question. But…I’d have to go with Frank Herbert’s Dune, in the end. The sheer scale of the universe he created, the questions it posed for humanity’s future, its philosophical bent…Dune has it all. And the spice: to travel without moving, life extension, prescience—it seems magical, but aren’t those things we want to have? But like some of Dune’s characters, when you are hollow inside, the spice becomes meaningless. You can travel anywhere in the universe, but emotionally, you haven’t moved at all. You can live forever, yet die a little each day as your humanity slips away. You can see the future—but are powerless to act, even at the moment of your foreseen demise. Dune, like all great science fiction, raises such questions. Fifty years later, we’re still unsure of the answers. That’s powerful. I’ve been reading a mixture of classic SF and current releases. Everything from The Martian by Andy Weir, to The Left Hand of Darkness by Ursula K. Le Guin. I’ve started reading The Dark Forest by Cixin Liu; I loved the previous volume, The Three-Body Problem. I’ve been devouring The Hyperion Cantos by Dan Simmons (I just started Book Four, The Rise of Endymion), and I’m looking forward to finally reading Ancillary Justice by Ann Leckie (I know I’m behind, but I’m catching up). There was a Nebula-nominated story this year, “The Grand Jete” by Rachel Swirsky, that still blows my mind. Of course, I recommend all of these. Right now I’m seeking an agent to help get my other books published. I’ve already written the second and third installments that follow Inherit the Stars (the second one was complete before I ever signed with Penguin). I have a neo-noir novel set on Mars that’s frenetic and gritty, as well as a historical fantasy based on Dante’s Inferno, with demon mercenaries and comedic elements. I’m getting ready to pen a new science fiction novel that highlights the conflict between superstition and reason once again, but in a far different milieu. Thank you so much for this opportunity to share my thoughts and ramblings. Wanderlust runs in Kivita Vondir’s blood. She dreamed of salvaging like her father when she was young, and now it’s her addiction, getting her through pit stops filled with cheap alcohol and cheaper companionship and distracting her from her broken heart. Inherit the Stars, interview, Tony Peak.